French Sea Clay: Absorbs impurities and toxic substances, while leaving essential natural oils and minimizing pore size. Volcanic Pumice Rock: Multi-level surface exfoliation that you control to clear dead skin cells, smoothing out fine lines and softening skin texture. Green Tea Leaf Pieces: GLAMGLOW® groundbreaking patent pending TEAOXI™ technology delivers fresh Super-Squalene, EGCG super antioxidants, and Polypenols directly into the mud from the real pieces of tea leaf. Apply a thin layer of youthmud on your skin. Wait for about 10 minutes until the mask is really dry. Waash your face with water in circular motion to remove mask. Hello! So yeayyyyy review time *clapclapclap* Hehehe well as I said earlier I really love this mask! As I only use it once, it does not really make any big changes on my face. But yeah my skin feel really smoother, brighter and softer. I can feel this hehe. And, the exfoliate process done really well I guess. Cause in a day my skin was peeling I don't know why. And I don't know if other users experience this. But you know, if you just let the peeling process, it just seems right after a day. Peeling is good actually sometimes to change for a new skin. amboi..seronok buat review..lama xsinggah sini..miss u! Hihi kena buat lah kak Niesa :) Missyoutoo! Hahaha siapakah yang nak bagi tuu? Eh2. Rm 2.40 ke rm 240?? Xmungkin2. Hahaha. Hehe betul tu RM240 untuk 50g. 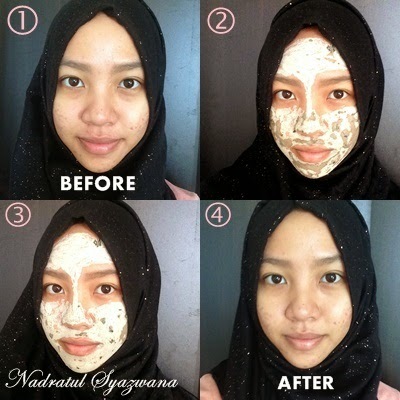 Yeayyy, memang Nad kerap guna madu as masker sebab senang dan diyakini sangat!